This 1992 CD was among my all-time favorite liner-notes assignments. Bay Cities producer Bruce Kimmel had this wild idea to record the chamber music of legendary Broadway songwriters Cy Coleman, Charles Strouse, John Kander and Harvey Schmidt. It was a dream assignment, getting to interview these amazing composers about music they never thought anyone would ever hear. It’s a wonderful album (with a fabulous cover painting by David Byrd), newly re-released on Kimmel’s current label Kritzerland. 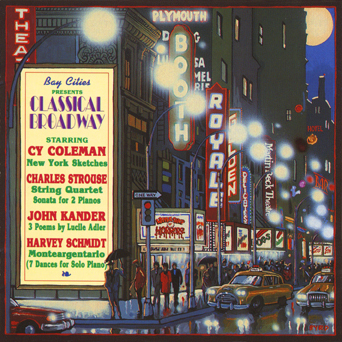 This entry was posted in Composers and tagged Bay Cities, chamber music, Charles Strouse, Classical Broadway, Cy Coleman, Harvey Schmidt, John Kander on September 15, 1992 by Jon Burlingame.